EVXO Foundations are Certified Organic, Gluten-Free, Vegan and Cruelty-Free with Natural Ingredients that never clog your pores. This long lasting foundation formula will accentuate your natural beauty! WHY CHOOSE OUR GLUTEN-FREE FOUNDATION? Our best-selling organic and gluten-free liquid foundation is formulated to not only even out your skin and keep you looking natural and glowing, but it also improves your skin while you wear it with skin helping ingredients like thyme and chamomile. This vegan foundation also includes gluten-free vitamin E, which is rare in cosmetics as most of the time vitamin E is taken from wheat ingredients. 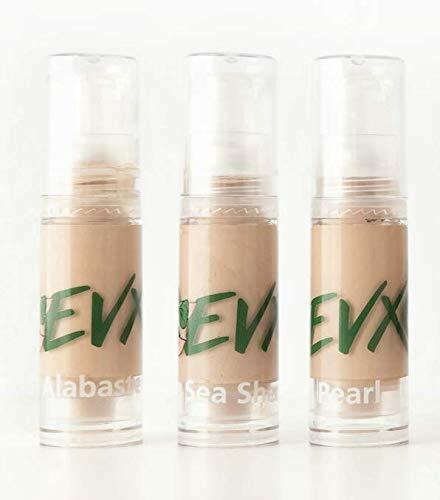 Even the most perfect of skin can have textural issues, and EVXO’s All Natural and Organic Foundation formula is designed to help you even out those issues while maintaining your natural beauty and covering problem areas. Full coverage foundations can give you an awful mask-like look, so we offer a foundation that will act as your second skin! Our organic foundation will give you the perfect natural fit your skin needs so you can look and feel like the best version of yourself! Proven in recent studies to be more effective than prescription creams at treating blemishes caused by an acne bacterium! Vitamin E oil works to block free radicals from the body which play a large part in the aging process.